Nothing like being late for your own Challenge! Sometimes life just gets in the way, that's my story and I'm sticking to it! I'll be adding this photo to the post from yesterday's Birds of a Feather Challenge - but will include all the details below. I'm in the process of cleaning out my studio, getting rid of things I haven't used in awhile (stamps, punches, older pattern papers) anybody need anything! Anyhow, I came across some 12" x 12" Jovial paper from Basic Grey and thought it would be perfect for the fabulous Birdcage Ornament that's in the Christmas Ornament Kit from SVG Cuts. The Birdcage and Wings were cut from the Jovial pattern paper, all other pieces were cut from card stock. To embellish the Birdcage, I cut the Poinsettia - Spindly from SVG Cuts 3D Wintergreens Kit from card stock using the Silhouette. I did resize all of the Poinsettia pieces by 80%, before cutting. The leaves and flower petals are simply pinched then layered on top of each other and glued in place with Glue Dots. For the small center pieces, I pushed them with a Stylus and glued in place with a Quickie Glue Pen. To hang the Birdcage, I added Ivory Vintage Seam Binding that I tied in a Double Bow using Becca's Peg Bow Maker. A little bit of Moss was added to the bottom of the cage, and the whole project was sprayed with Perfect Pearls Mist for some added shimmer. Beautiful bird cage, you are one step ahead of me, still haven't done mine yet. Now I have not really been stamping that long, but boy the collection I have and I am not at all sure why I bought some that I did in the beginning! I guess it was not knowing where my "likes" would take me! Good luck with that! 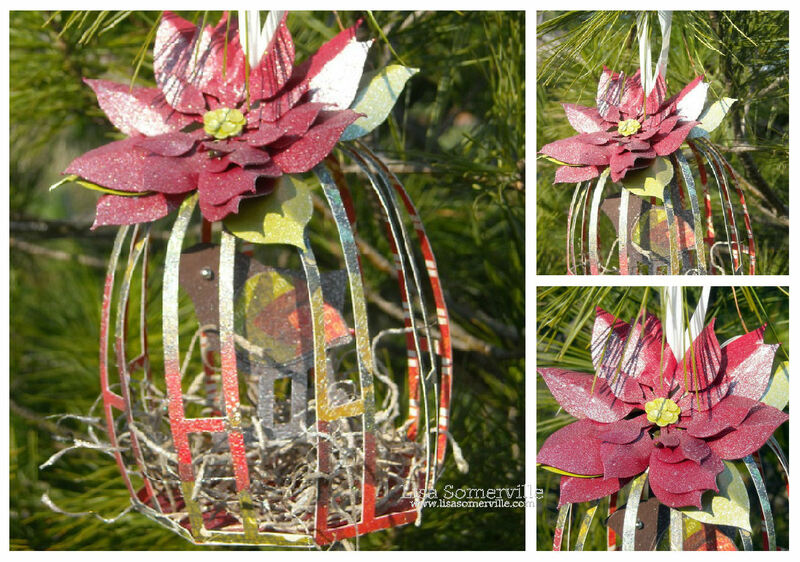 Love your birdcage ornament! The poinsetta on the top is so clever! Have a great weekend! What a brilliant piece... so clever how you've created the cage, and it looks beautiful! The birdcage the flower and everything about this is fabulous! Gorgeous home decor!